Ok, hikers and outdoor lovers. The #GreatPNW struggle is real. You decide it’s a great day for a hike, so you head out into the wild & find upon your arrival that the rest of Seattle has had the same – exact – idea. Never mind that all the great minds thought like you. How ’bout that parking? Don’t let the day get ruined by the lack of available parking. You won’t need a car. We’re bringing back Trailhead Direct! Trailhead Direct is a seasonal transit service to popular hiking destinations in King County. 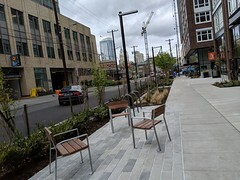 Trailhead Direct is a pilot project in collaboration with our Seattle Transportation Benefit District (STBD), King County Metro, and King County Parks and REI. Not only does this program provide transit service on weekends and most holidays to popular hiking trails in the area, but it also eases vehicle congestion and reduces safety hazards. There’re 4 great changes happening this Saturday, April 20. The weather. We’ll get a cloud break. THERE. WILL. BE. SUN. Well, at least that’s what the weather forecasters predict. The start of Trailhead Direct!! The 2019 season begins on April 20. The launch of a new Trailhead Direct route to the Sky Country Trailhead at Cougar Mountain Regional Wildland Park. Check out the details here. The Trailhead Direct for Mailbox Peak returns with a new service location + stop. So go ahead and pick your destination. Select your location for all the dirt 😉 from trailhead maps, transit pickup and drop off locations, and maps. 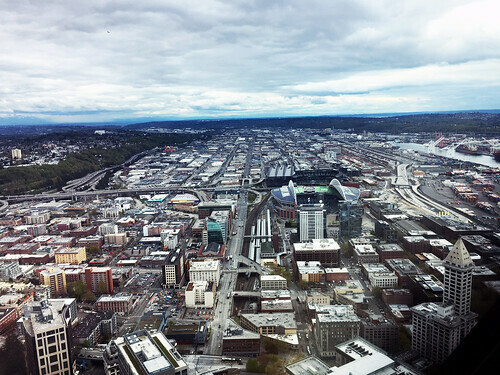 We’re proud to work as a funding partner with King County Metro to provide more mobility options to attractions in the Seattle region. Funding Trailhead Direct builds on the City of Seattle’s investments in the Seattle transit network where we’ve been able to improve frequency/reliability on 64 other routes. This program is an opportunity to provide better access for more people to the outdoors. While trail destinations vary in accessibility, Trailhead Direct transit are wheelchair accessible, so all are welcome! 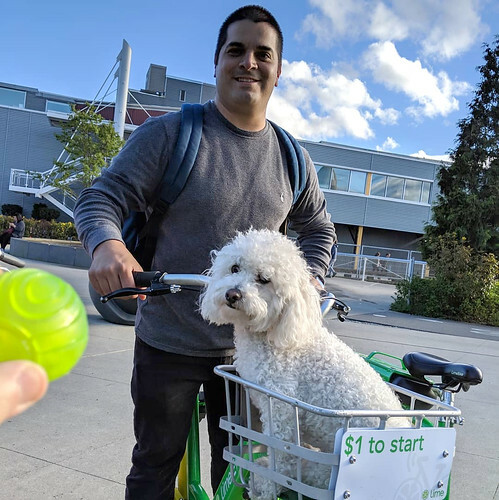 Thanks to Seattle voters, we’re able to directly purchase transit service for Seattle, providing mobility options to explore the Seattle area. For more information about Trailhead Direct, please visit the website. If you had to use Doritos, Reeses, & popcorn to create the best munchie, what would you make? Yesterday, we buddied up with Lyft, local media personalities, cannabis retailers, and safe streets partners for a cooking showdown to answer that question, but more importantly, raise awareness around impaired driving and get the word out about safe ride options this 4/20. But first! A discount for you. 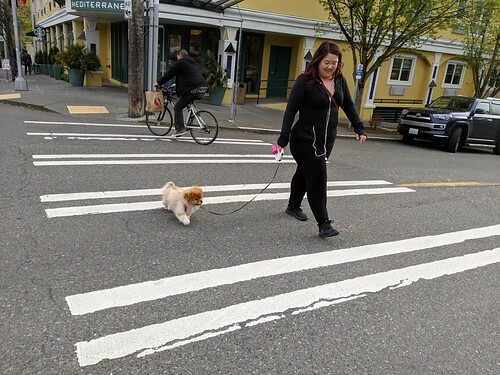 Before diving into the details of our quirky event, let’s cut to the first part of the chase: as part of our ongoing Vision Zero safe ride partnership, new and existing Lyft riders across the region can get $4.20 off a ride on April 20, using code 420SEA19. Taking transit, befriending a designated driver, cabbing it, sleeping it off – these are all also solid options. Bottom line, don’t get behind the wheel if you’ve been partoking (⬅️ see what we did there) in 4/20 festivities. We threw it down for a really, really great cause. Our own Sam Zimbabwe joined Lyft’s Todd Kelsay and Seattle Police Department’s Lt. Phil Hay for some opening remarks, reminding us all of the critical issues at hand, and of the opportunity we have to work collectively toward safer streets for all. This was our second annual Baked! Munchies Challenge, a quirky spin-off of Chopped, but without Ted Allen (we did, however, get a pop-by from Tom Douglas! ), bizarre secret ingredients, or an ice cream machine. And for anyone wondering, there wasn’t any cannabis consumption. We work for the government. C’mon now. Despite the absence of special brownies, a lot of fun was had by all. It’s not often that we get to bring lightheartedness to the issue of traffic safety, particularly the topic of impairment. And there’s a good reason – it’s a serious issue. For the past several years, we’ve seen impairment contribute to close to 20% of fatal crashes in Seattle. Preliminary 2018 data indicate that 50% of fatal crashes on Seattle’s streets involved impairment. The trend at the state level is similar. Driver impairment due to alcohol and/or drugs is the number one contributing factor in Washington fatal crashes, involved in nearly half of all traffic deaths. Poly-drug drivers (combo of alcohol + drugs) is now the most common type of impairment among drivers in fatal crashes. The most cited combo? Alcohol and THC. So, how can we help reverse this trend? For starters, we can talk about it and educate folks, not just around the rules, but also the impacts of driving impaired, and the options available. It may be legal to get high, but it’s not legal to drive under the influence. Of anything. While some people may think cannabis can sharpen their driving skills and cause them to drive slower, quite the opposite is true. According to the CDC, marijuana can slow your reaction time and ability to make decisions, impair coordination, and distort perception – all key functions of driving. Check out this video from our friends at the Washington Traffic Safety Commission, featuring Vivian McPeak, Executive Director of Hempfest. Vivian and his wife, Kanti Selig both participated as Baked! chefs (and are our new BFFs). Don’t believe these guys? Well, a few of us tested out some cannabis goggles, and our partners with the Seattle Police Department helped confirm our suspicions: driving under the influence of anything is not a good choice. And that’s what this event was about – teaming up with a variety of people and organizations, toward a shared vision of safer streets. We had local cannabis retail shop owners and advocates, an array of local media, MADD Washington, SPD, Public Health Seattle & King County, and of course, folks from SDOT and Lyft all working together. The hope is that we can continue to join forces to reach key audiences with information and resources so they can make informed, safer choices. Look at all these lovely people who came together for this important cause! So, who made the best dish? These guys did – right here! 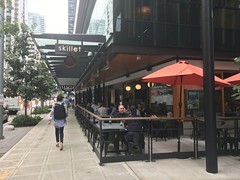 A team comprised of SPD’s Patrick Michaud, KOMO’s Elisa Jaffe, Lyft driver and catering company owner Nikki Easterbrooks, and former chef Kanti Selig turned out the winning plate – a combo of savory tacos and a sweet side of chocolate and caramel covered matzo. They’re pictured below with judges Michelle Davis (MADD WA Chair), Guy Devillier (Lyft driver turned restaurant owner), Erin Combs (Lyft), and Emcee Ross Fletcher. The judges agreed, it had the highest degree of munchability. UPDATE: Guy’s restaurant, That’s Amore, will be serving up a rendition of the competition’s honorable mention Dorito-topped mac and cheese this weekend (jalapeño for adults, nacho cheese for kids) made by Q13’s Ellen Tailor and team. AND, all proceeds from the sale of those dishes will go to MADD WA. We’re loving the partnerships formed within this event already! All (very admittedly) corny pot puns aside, please do plan ahead if you plan to party on 4/20. Learn more about our Vision Zero efforts and our ongoing partnership with Lyft at www.seattle.gov/visionzero. Hey! I’m walkin’ (to work) here! Walk to Work Day is April 5. 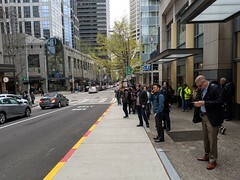 As we continue through the #SeattleSqueeze, walking continues to be a great option to get to and through downtown, and Walk to Work day is the perfect day to get started. Walking keeps you healthy, happy, and helps the environment. Wins all around! Adding any number of steps to your day, even if it’s just a small part of your commute, is a great way to burn calories, lower your risk of chronic disease, improve your mood, and is free. #Winning! Even if you don’t live within walking distance to your workplace, you can look for ways to add in some extra steps, like getting off the bus a stop early. Y’know, to pick up a donut and offset those burned calories. You earned it. This koala added strength training to their cardio routine. 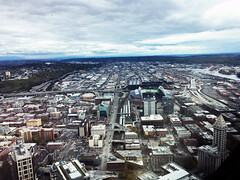 Check out the Seattle Walking Map! This map was designed to help people choose a walking route that best suits their interests and fitness level. It includes routes that follow sidewalks, shoulders on quiet streets, and park trails. 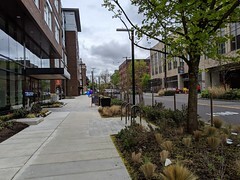 The South Seattle Walking Map is one of three walking maps throughout the city. King County Metro’s Downtown Accessibility Map lets you plan trips to downtown Seattle destinations that avoid the hills using public transportation and a variety of building elevators and escalators. Regardless of how you’re getting around, remember to look out for yourself and others. 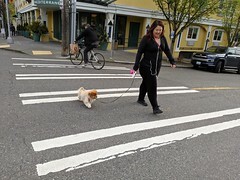 All intersections (not just the marked crosswalks) are legal crossings. Expect pedestrians and be on the lookout for people crossing the street. Look both ways (remember what we learned as children: left, right, left again). It’s also a good idea to look over your shoulder for turning vehicles. If you’re driving, take it slow. Math + basic physics = increased crashes as speed increases. And survivability for pedestrians involved in a crash goes down with each additional MPH. 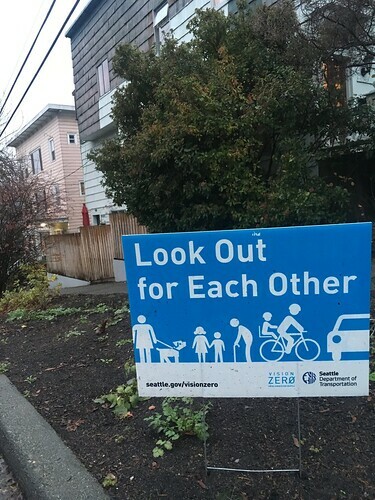 It’s 20 MPH on residential streets, and 25 MPH on arterials, unless otherwise posted. Pay attention. No matter how you get around, get your head out of your apps. Keep your phone out of reach, especially when you’re behind the wheel. If you’re crossing the street, pop it into your pocket and be aware of your surroundings. Bonus points: bring a furry friend. Making the most of the Move Seattle Levy resources to implement the Bicycle Master Plan. 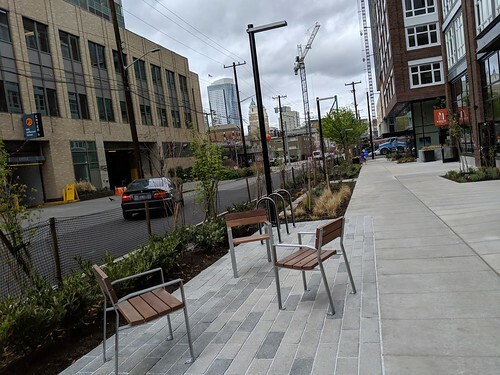 Over the past 3 years, the City of Seattle has built 27 miles of new bike facilities. Mayor Durkan and SDOT Director, Sam Zimbabwe are committed to continuing to build a connected bike network as Seattle grows. 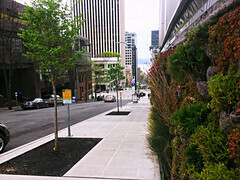 We know many people are talking about how we’re implementing Seattle’s 2014 Bicycle Master Plan (BMP) recommendations. 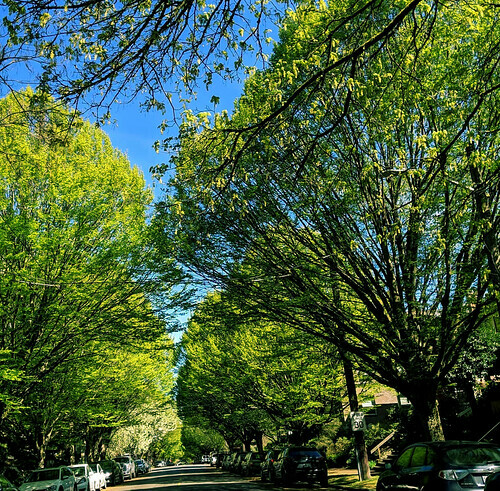 We recently submitted to City Council a draft BMP Implementation Plan – a list of projects we’ve currently secured funding for to complete in the next six years. Let’s talk about what this means. Last fall, we completed a comprehensive reassessment of the Levy to Move Seattle under the leadership of Mayor Durkan based on more realistic assumptions than we used in 2015. The Bike Master Plan is funded in large part by the Levy so we’ve been working with the Seattle Bicycle Advisory Board to prioritize the projects in the Bike Master Plan to make the best investments and maximize safety, connectivity, equity, ridership, and livability. Enter the draft BMP Implementation Plan. This plan reprioritizes projects based on available funding – keeping in mind that we’re also working to secure additional funds that would allow us to construct more projects. We’re taking public comments on the draft Implementation Plan plan until April 30. We’ll then submit a revised version to City Council. Once the plan is complete, there are still many steps that need to be taken before a project is built because things can change over time. For example, we may need to revise the plan if something unforeseen comes up during engineering, if there are coordination challenges with other public and private projects, or as we learn about other issues through community engagement. One way we can advance transparency is to identify potential risks or issues that may change over time, and by engaging in an open public process. Our goal is to be upfront about what we’ll need to consider before each project is built. 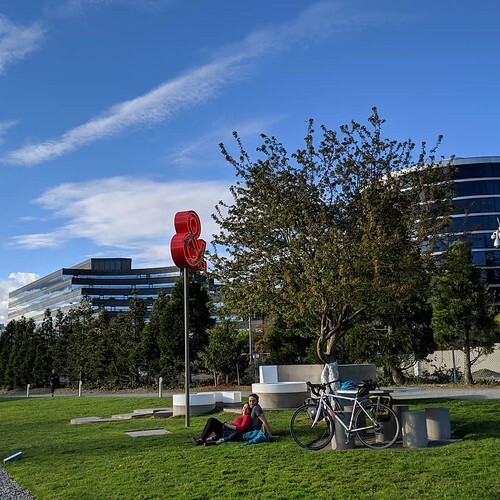 The draft BMP Implementation Plan anticipates constructing 49 miles of bicycle facilities and designing an additional 13 miles using a combination of Levy to Move Seattle and other project funding. The plan identifies projects and programs which, combined with existing facilities, will make significant progress towards implementing the BMP recommendations over the next six years. 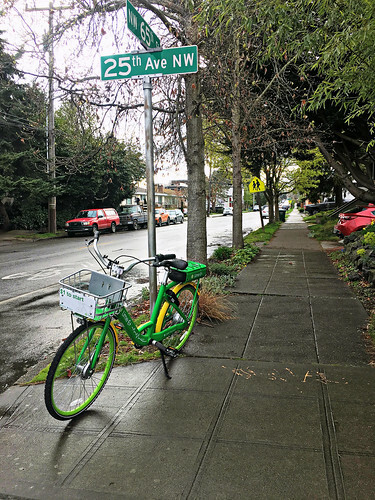 It works to achieve an all ages and abilities bike network through a combination of protected bike lanes, trails, neighborhood greenways, and funding for bike parking, encouragement programs, and safety education. Here’s what we’re proposing.
. P R O P O S E D .
Bike Master Plan projects/recommendations over the next six years. 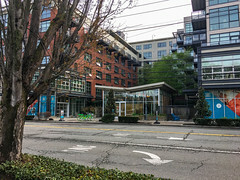 The following maps show numbered projects in geographic sections: North, Central, and South Seattle. Reference the project number with the Project Funded List below.
. P R O J E C T S F U N D E D L I S T .
Projects funded through construction by risk. In 2018, bike ridership increased by 12% compared to last year. This week we’ll discuss the proposed draft BMP Implementation Plan with City Council, the Levy to Move Seattle Oversight Committee, & the Seattle Bicycle Advisory Board. Stay tuned, we’re working with the Department of Neighborhoods & planning three four open houses in April. At the open houses, you’ll learn about the value of a bicycle network, get your questions answered about how the project list was developed, and hear your thoughts on the projects. 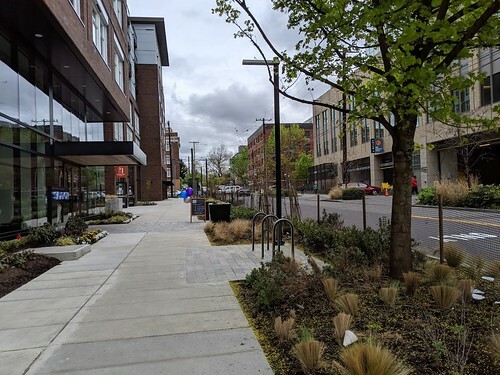 We’ll also share a summary of what we heard from the Seattle Bicycle Advisory Board and other stakeholders and then finalize the plan and update City Council. As individual projects move forward, we’ll continue to engage with the community as we move through design and construction. Keeping you in the Levy loop. 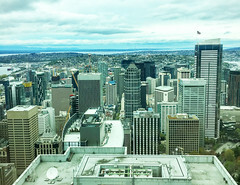 We completed a comprehensive reassessment on the Levy to Move Seattle. 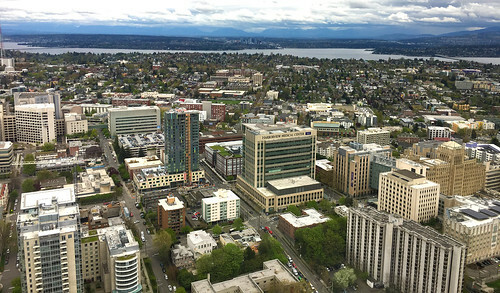 Last fall, we completed a comprehensive reassessment on the Levy to Move Seattle under the leadership of Mayor Durkan. The update was based on more realistic assumptions than we used in 2015. This is an update on the improvements we’ve made since the levy work began in 2016. We also published the 2018 Annual Levy to Move Seattle Report which details our performance and financial progress from last year. The report provides a status update for the planned levy deliverables. This is our most detailed report yet, giving the Levy Oversight Committee, elected officials, and the general public the information needed to track progress and hold us accountable. 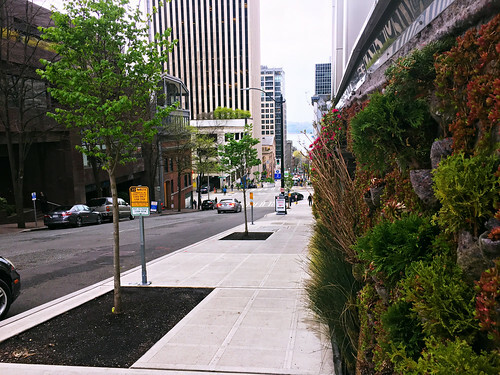 Our crews & contractors are progressing on completing projects that carried over from 2018. We’re constructing a new bridge over the train tracks on S Lander St between 1st and 4th Avenues S to improve access and relieve congestion in SODO. We’re replacing the existing bridge to meet current seismic standards and improve traffic flow. 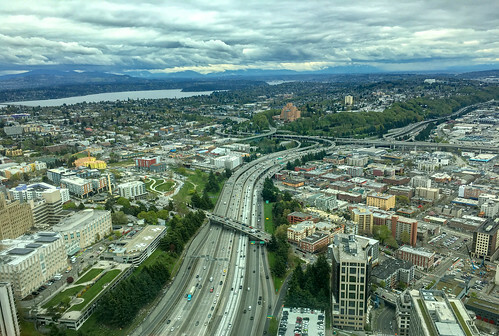 We’re designing and constructing a new pedestrian and bicycle overpass across Interstate 5 to improve neighborhood connection and access in Northgate. We’ll continue to keep you informed on Levy progress through quarterly & annual reports. Keep a lookout for our Bike Master Plan 2019-2024 Implementation Plan and project list.